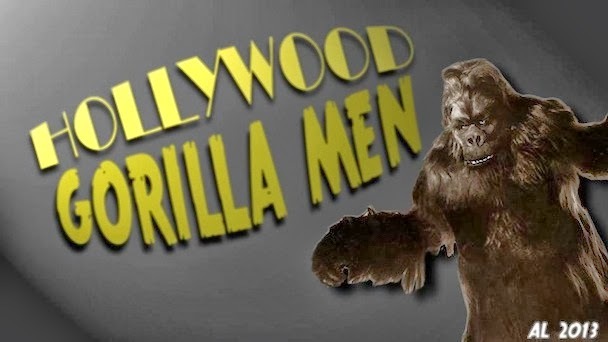 Hollywood Gorilla Men: Western Costume Gorilla ! No, were not talking about a gorilla in a cowboy outfit, but rather a gorilla suit made and sold by the world famous Western Costume in beautiful Hollywood. Western Costume made literally 10's of thousands of costumes of every variety throughout the course of them being in business. Everything from Sci-Fi to comedy...Horror to epic biblical films! This didn't stop film producers from putting the Western gorilla to good use, both as a "reel" gorilla, or as the set up for a long time gag as old as gorilla movies have been around. 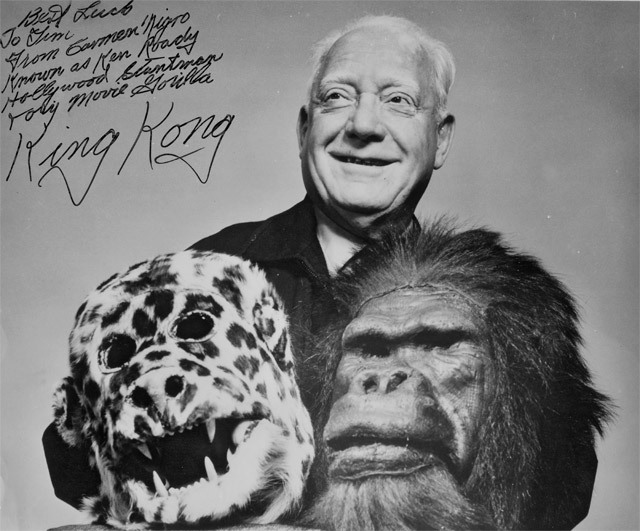 The movie has a "real" gorilla, played by one of our legendary Gorilla Men. There is also in the story a "fake" gorilla. This is a human character in the script who dons a gorilla suit, usually to frighten the other characters for some reason. The gag is that eventually the "real" gorilla shows up and is confused for the "fake" gorilla. The thing that makes this gag work, is that in order to make you buy into the idea that there is a "real" gorilla, the "fake" gorilla has to be noticeably less realistic. This is where the Western Costume gorilla steps in. 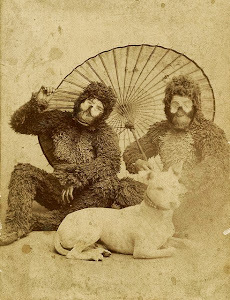 While it's much enormously better than the crappy Halloween gorillas we find today, the Western gorilla was a poor substitute for a real Gorilla Man suit. A very good example is the movie "Gorilla at Large". Master Gorilla Man ,George Barrows plays the role of Goliath, the biggest, fiercest gorilla ever in captivity. At one point in the story, Cameron Mitchell is called upon to don a gorilla suit to substitute for Goliath. You guessed it...The Western Costume Gorilla ! The difference in the suits really drives the point home, that Barrows was a "real" gorilla. The Western Gorilla has been used as a "real" gorilla on occasion. One time that comes to mind is the classic Jungle Jim and the Lost Tribe. There is a sequence in the Lost Tribe were there are nearly a dozen gorillas on the screen at one time. The bulk of the gorillas were suits owned by Ray Corrigan, and Steve Calvert. Charlie Gemora's incredible suit from "The Monster and the Girl" also appears in this giant simian battle against the villains in the picture. 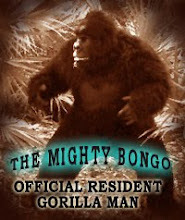 In order to flesh out the huge contingent of gorillas, there is a Western Costume Gorilla in the mix. The producers probably intended to use it in the background, but there a several quick shots of it that are fairly clear. 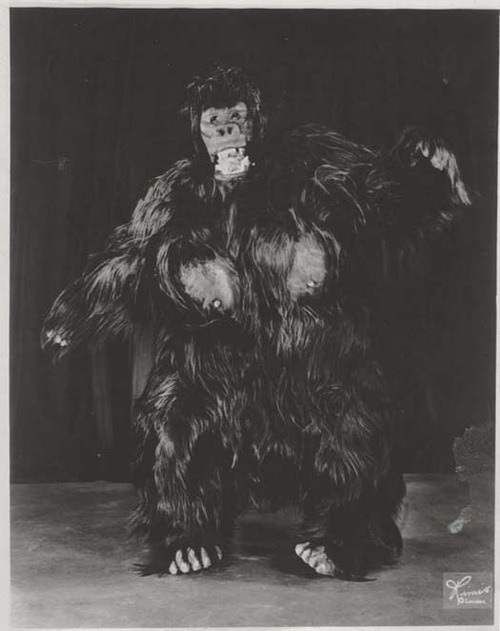 The Western Costumes Gorilla was also sold to the public, and found it's way into dozens of Magic shows, Carnival side shows, live Spook Shows and the like. One interesting side note, back in the late 70's after the release of Dino Delaurentis"s King Kong remake, (featuring Gorilla master, Rick Baker as the King), an elderly gentleman named Carmen Nigro came forward and claimed to have played the Original King Kong in 1933 ! It is also well documented that the 1933 King Kong was not a man in a suit, but rather an 18" stop motion animation puppet. 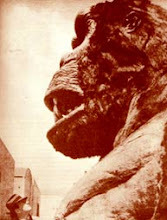 Carmen Had photos on himself posing proudly with his "Kong" suit, and once again, it was a Western Costume gorilla. Apparently Carmen wanted very desperately to have his moment of fame, and were it not for devotees of simian cinema, his word may have still been taken as the truth.